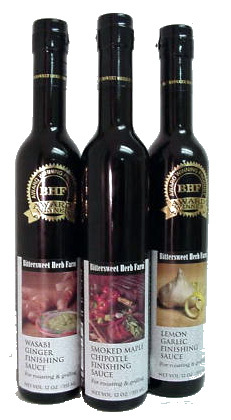 Bittersweet Herb Farms Finishing Sauces - Available in 3 sensational flavors. Wasabi Ginger, Smoked Maple Chipotle, & Lemon Garlic. These 3 exciting award winning sauces will be the delight of any meal. Use as a marinade, basting sauce or simply heat & brush on finished meats. Great served over rice or steamed vegetables. Wasabi Ginger is wonderful for stir-frying & fantastic on grilled tuna. Smoked Maple Chipotle makes a superb dipping sauce & is great over sauteed tofu. Lemon Garlic is a match for grilled fish, poultry, potatoes & more. Once you taste, let your imagination lead you to gastronomia! Handsomely packaged set of 3 sauces, 9 oz ea.